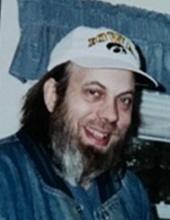 Steven L. Cooper, age 58, of Burlington, Iowa and formerly of Oquawka, IL passed away at his Burlington residence on Friday November 23, 2018 at 8:35 pm. Steven was born on December 1, 1959 in Macomb, Illinois and is the son of Raus C. and Wanda L. Dixon Cooper. His early life was in Macomb and the family moved to Oquawka where he attended the Oquawka grade school, Tri-Valley Middle School, and then graduated from Union High School in the class of 1978. Steven began work with the Mark Twain restaurant in Burlington where he was a cook. He later was employed at Heartland Cardboard Box Company in Burlington, and then was employed 17 1/2 years at Walmart where he was a warehouseman in Mt. Pleasant, Iowa. Steven loved to go to garage sales and flea markets. He loved to go mushrooming and loved his Mountain Dew. Surviving him is his mother, Wanda L. Cooper of Burlington, Iowa and two sisters, Lisa Thompson (Mike) of Oquawka, Illinois and Christine Clark (Jay) of Lake of the Ozarks, Missouri. Also a number of Nieces and Nephews also are surviving. He is preceded in death by his father and his grandparents. To send flowers or a remembrance gift to the family of Steven L. Cooper, please visit our Tribute Store. "Email Address" would like to share the life celebration of Steven L. Cooper. Click on the "link" to go to share a favorite memory or leave a condolence message for the family.